Geraniums are typically known as an outdoor plant, but actually work quite well as an indoor potted plant all year long. 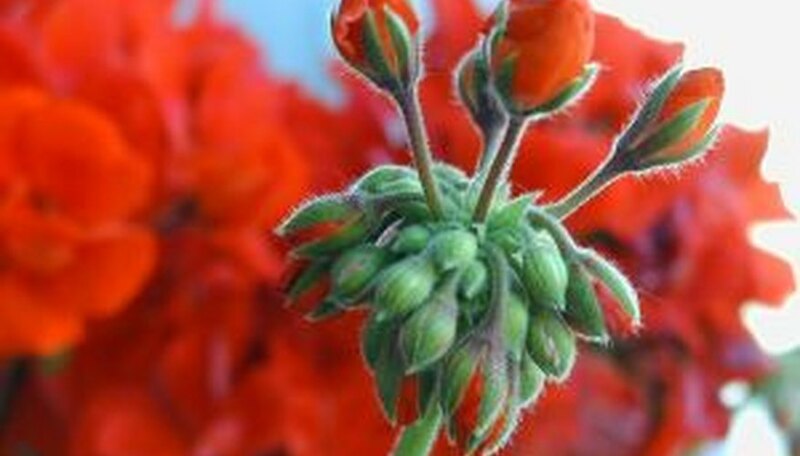 Geraniums are usually available for purchase beginning the spring months. There are many varieties from which to choose, including “Ivy Leaf Geraniums” commonly used as hanging plants and “Martha Washington Geraniums” that are suited better in pots. Whatever geranium you grow indoors, it will help make your home feel like spring, even in the dead of winter. Plant your geranium in a large container that has good drainage, like a hanging basket, flower pot or window box with small drainage holes. The soil needs to also be well draining and high in organic matter. Place your indoor geraniums on the south or west side of your home, near a window. If this is not possible, you can use artificial light by placing your geranium a foot under a 40-watt fluorescent light bulb for about 16 hours a day. Ideal temperatures for geraniums are between 65 and 70 degrees Fahrenheit during the day and 55 degrees during the night. Water your geraniums when the soil dries out four to six inches into the soil. Geraniums thrive more when the soil is allowed to dry a bit between waterings. When your geranium is dry to this depth, water it well enough so that some of the water drains out the bottom. Fertilize your indoor geranium every other month from March until October. Use a fertilizer available at your local home and garden store that is labeled for container-grown plants. Follow the dosing instructions on the label, as each brand of fertilizer has different strengths.